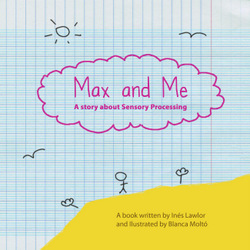 Written by Inés Lawlor, an occupational therapist, Max and Me is a book written for children to help them understand how their bodies and brain process sensory information, and why they may sometimes have a bad day! 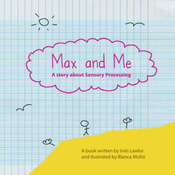 An Overview of "Max and Me"
Written simply and openly, the book introduces children to an imaginary "modulator", Max, who lives inside their brains. Clear, vivid illustrations help children to understand and identify with the information and the story. The book is written in 3 parts. Part I introduces Max, and shows how the modulator receives information from all the senses, how he processes the information and how he tells the body what to do. Part II describes how going to school causes the narrator's modulator to become overwhelmed and stressed by the overload of sensory information. The narrator's mom is a fount of wisdom and helps the little boy to understand what is happening and to find ways to deal with overwhelming sensory experiences. Part III describes what happens when a modulator "shuts down" through lack of stimulation or tiredness. Again, the narrator's mom helps him find ways to "wake Max up" and get him to focus again. All 3 parts of the book provide parents and therapists with opportunities to discuss the information given and help kids to make the connection with their own experiences and to develop their own strategies for coping with sensory "meltdowns", "not paying attention" and other symptoms of poor sensory modulation. I found this book informative and fascinating! I read it to all 3 of my kids in one sitting, although I had initially planned to read it to them separately and in small doses. They just did not want me to stop, and they really engaged with the information and the story. My older son identifies more with Part II, where Max goes into sensory overload and causes a mini meltdown. I wish I had had this book when he was younger. Although he is older now and has learned how to calm himself down when things get too much, there were still "aha!' moments, when he understood why a particular activity is really calming for him. It was also really helpful for him identify for himself the senses that most easily get overwhelmed. My younger two tend to identify more with Part III, with sleepy modulators *grin* and it was really helpful for them to understand why I often give them intense movement breaks during our homeschool day - to wake up their modulators! And as for mom - I could explain to them why I chew gum when driving long distances to keep my modulator awake! And it was also helpful to be able to explain that at 8pm, my modulator is in danger of a meltdown and that is why they need to go to bed NOW *grin*! I personally prefer to read the book in stages. In the first sitting, I introduce the concept of a modulator in Part I and discuss the senses and how the information gets to the brain. However, lots of kids DO have issues with both areas, and I do read both parts with them, but I prefer to start with the part which is the most challenging. The book gives the child the opportunity to verbalize or indicate which senses are the most over or under responsive, and to help identify situations in which over and under stimulation occurs. The coping strategies suggested are a good springboard into exploring a range of possibilities, and can really help to empower a child. All in all, a very worthwhile and valuable resource. Although I received this book as a free sample, the review is completely honest and all mine! Or order directly from the Max and Me website.